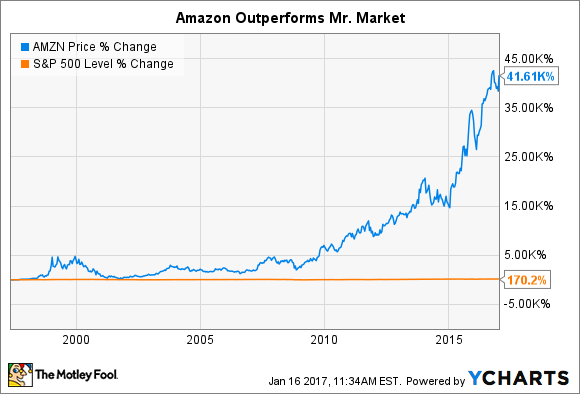 Though Amazon.com stock has risen nearly 40,000% since the late '90s, it isn’t too late for investors to benefit from its continued growth. Perhaps more surprising, Amazon remains fairly early on in realizing its long-term growth potential. Here's why it certainly isn't too late for the average investor to profit from this proven millionaire-maker stock. As one of the most iconic tech companies in the world, Amazon's meteoric rise has been documented thoroughly. Over the past twenty-plus years, CEO Jeff Bezos and his team have built the world's largest e-commerce company, which also has interests in an increasingly diverse mix of businesses like cloud computing, entertainment, logistics and fulfillment, and more. Amazon's sales surpassed $100 billion for the first time ever in 2015, a point at which many companies find themselves at or near maturity. Image source: U.S. Department of Commerce. Keep in mind that that single-digit percentage figure represents total U.S. retail sales, of which Amazon itself is only a fraction. Maybe it's just me, but I find this simply astounding. After more than two decades of redefining the retail landscape in one of the world's most technologically advanced countries, Amazon only captures a mere fraction of total retail sales. Looking at this through a more global lens, researcher eMarketer estimates that worldwide e-commerce sales will effectively double from about 7% of total retail in 2015 to about 15% in 2020. On an absolute basis, this implies the global e-commerce market will be worth an estimated $4 trillion by the end of the decade. As the largest and most innovative company in this space, Amazon stands to benefit tremendously from this ongoing shift. Seen through this lens, one can fairly argue that Amazon still offers plenty of future growth potential for investors, even at its current size. Beyond Amazon's underappreciated e-commerce story, two additional factors should contribute to the company's growth, and also deserve brief discussion. The first is Amazon's ability to invent. Amazon has proven quite adept at finding ways to lower its cost structure by pivoting the skill sets it develops in running its own operations into third-party services. The clear data point underpinning this is Amazon's leading cloud-computing platform AWS, which Bezos believes will eventually grow into a $100 billion operating segment in its own right. Amazon is reportedly considering pursuing a similar course in the global logistics and supply-chain business, which is also in the throes of its own digital disruption. It isn't clear exactly what this could mean for Amazon's long-term profitability, but such a maneuver would almost certainly be a net benefit to shareholders. The second factor is Amazon's valuation. It is a frequent observation that Amazon shares are rarely cheap on a superficial basis. Digging beyond the surface-level numbers, though, can tell quite a different story. For example, Amazon carries current and forward price-to-earnings ratios of 185 and 91, respectively. However, if you look at Amazon on a cash flow basis, the company trades at a price-to-CFO (cash flow from operations) ratio of approximately 27. The implication here is that Amazon is, in this sense at least, far cheaper than its accounting earnings suggest. It's easy to conclude that large companies like Amazon.com cannot continue to increase their sales at above-average rates. In fact, that is often the case. However, Amazon.com is the kind of growth stock that comes along once in a generation, and the company's sales growth should continue for years to come.